Please note: These links will launch a new browser window. There are 43 conservation districts in Washington State. 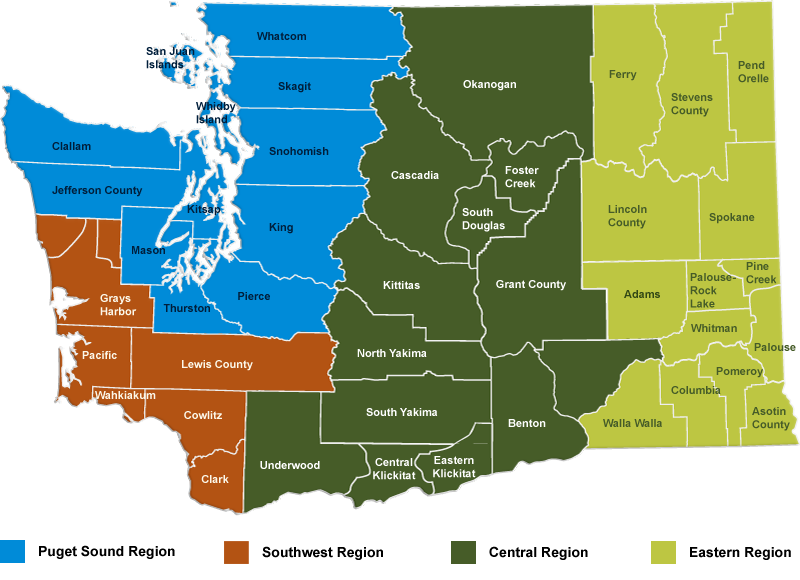 Leadership for these conservation districts is provided by the Washington State Conservation Commission and the Washington Association of Conservation Districts. Click on any district to view contact information. Visit some of our favorite websites for related natural resource management information and services. If you can’t find the information you are looking for on our website, try the links below. The Natural Resources Conservation Service (NRCS), formerly the Soil Conservation Service, has been serving landowners since the Dust Bowl days of the 1930s. Originally formed to solve soil erosion problems, the NRCS has expanded its services and offers financial and technical assistance to help agricultural producers make and maintain conservation improvements on their land. The NRCS Field Offices implement many of the Conservation Measures of the Farm Bill at the local level. NRCS supports the efforts of the King Conservation District, providing training and assistance as needed to District personnel. The NRCS also develops the practice standards used by District personnel to create and implement natural resource management projects and farm plans. In March 2013, the twelve conservation districts that form the Puget Sound Conservation Districts Caucus signed an Interlocal Agreement that paves the way for extensive collaboration. This agreement allows the member CDs to share financial resources, technical expertise, and staff as needed to address regional issues and needs. “We’re really excited to have this tool,” says King Conservation District Senior Program Manager Brandy Reed. “Puget Sound touches all of us so working together to save this important resource just makes sense.” Reed provides staff support to the Caucus in addition to managing a variety of programs within the King Conservation District.